We have objected to a proposal to erect over five kilometres of fencing on Fylingdales Moor common in the North York Moors National Park. The application has been made by the Manor of Fyling Court Leet which wants to graze livestock there. Because the fencing is on common land, the applicant must obtain the consent of the Secretary of State for Environment, Food and Rural Affairs under section 38 of the Commons Act 2006. We argue that the proposed fencing would be on open moorland of great natural beauty in a national park, and would impair the landscape and people’s enjoyment of its wide vistas. The public has the right to walk over the whole common and the fencing would restrict that access. It might also restrict access to the public bridleway and two public footpaths which cross the common. The fencing would not follow the boundary of the common so parts of it would be cut off completely from the public. The society is also concerned that a scheduled ancient monument, Green Dike, might be threatened by the introduction of cattle here. 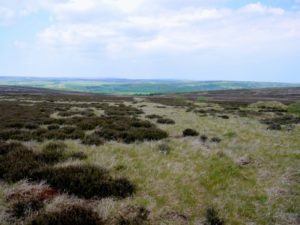 Says Kate Ashbrook, general secretary of the Open Spaces Society: ‘We have objected to this application because we believe it would have a severely damaging effect on the natural beauty and open feeling of this splendid moorland and on the public’s access to it. ‘The fencing would conflict with the purposes of the North York Moors National Parks. It may be well-intentioned but it is misguided.